Get Started NOW – Call or… click here! Click Here to Shop & Reserve Your 2019 Myrtle Beach/North Myrtle Beach/Ocean Isle Beach Weddings Online Now! 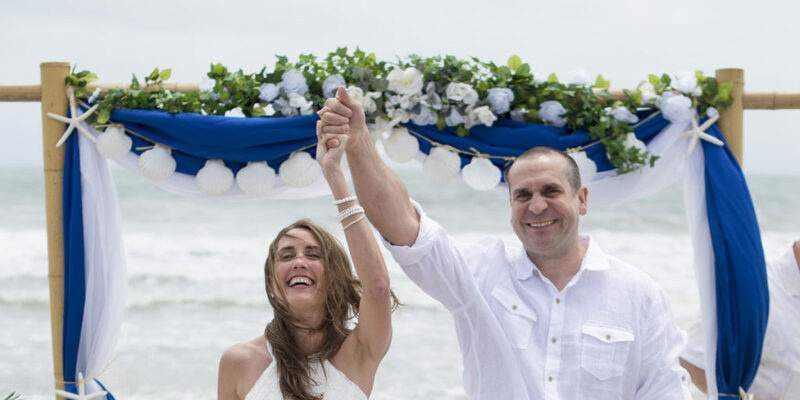 All Myrtle Beach wedding packages Gold and Up INCLUDE Bamboo Arch, Professional Photographer*, Beautiful Customized Isle Decorations, Sand Ceremony, Beautiful Heart Carved in Sand and more. You found us!!! Why pay more? Reserve your date TODAY! Check out our Myrtle Beach Wedding Packages click here! Our new Myrtle Beach Wedding Packages are here! click here Your Myrtle Beach wedding venue is the BEACH! Perhaps the easiest & funnest way to book your beautiful Myrtle Beach Weddings online is at HitchedAtTheBeach.com. To get started now click here! *We did a survey with our customers and 10 out of 10 voted that Hitched at the Beach offers the best wedding values at the beach for beautiful Myrtle Beach weddings & wedding packages.